The students' union at the University of Bristol has voted to disaffiliate itself from the National Union of Students (NUS). At an AGM on Thursday, students voted 227 to 145 in favour of forming an independent union, with 22 abstentions. 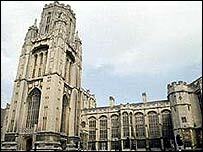 The Bristol Students' Union was a founding member of the NUS. It said the national union was now too expensive and did not adequately represent Bristol students. President of the student union Can Okar, who proposed the motion, told BBC News Online: "It costs more than £40,000 a year to be part of the NUS. "We felt it wasn't value for money and we don't feel it is representative of the student body here. "We have to now look at alternatives to having some kind of national voice." The decision can be overturned by a referendum. Bristol University is not the first union to make the break. It joins unions at Southampton, Imperial College and in Scotland. One student, Tom Davies, said it was not the first time the union had tried to make the break. "Most people won't think this will make any difference, maybe a few less discounts in student shops. "Bristol students are politically disengaged from student and national politics anyway."